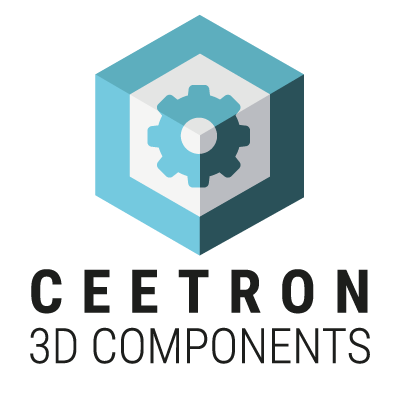 Ceetron 3D Components is a component-based software development kit for the design and implementation of visualization applications for engineering simulation data. Applications can be developed stand-alone or fully integrated within the simulation applications. By using Ceetron 3D Components, you add premium result representation to your simulation product. Combined with our free viewers, Ceetron 3D Viewer and Ceetron 3D Plugin, applications built with 3D Components enable easy sharing of 3D engineering information with colleagues, partners and customers. Ceetron 3D Components (3DC) is a component-based platform you can use to quickly build applications to visualize very-large-scale FEA and CFD data sets. It is designed, from the ground up, to provide the performance and instant scalability required by the scientific and engineering communities. Its architecture allows the seamless incorporation of cloud-based server power, on demand. Ceetron’s 3D Components (3DC) is a component-based platform you can use to quickly build applications to visualize very-large-scale FEA and CFD data sets. It is designed, from the ground up, to provide the performance and instant scalability required by the scientific and engineering communities. Its architecture allows the seamless incorporation of cloud-based server power, on demand. Because the large data sets themselves never have to be transmitted, you and your customers can work across departmental and geographical boundaries in real time. Could you build these visualizations from scratch? Of course—but the cost in time and lost opportunity would be difficult to justify. Ceetron’s 3DC platform minimizes the amount of time you spend to achieve such quality visualizations—which maximizes the resources you can allocate to the physics and numerics of your solvers. Ceetron 3D Components is delivered as a binary distribution. It comes with extensive online help and full documentation of its functionality and programming interface. A clear set of tutorials is also provided, illustrating “sample code” for specific use cases. And finally, it contains a complete demo application—including source code—that you can use to start the development process far ahead of square one. 3DC increases productivity by simply eliminating a large amount of the work needed to build visualization engines. The tools delivered with the platform, including ready-built interfaces that integrate with major GUI frameworks, let you focus on the tasks where your worth is actually measured. 3DC lets you build visualization applications that either stand alone, or are fully integrated with the simulation processors that need them. By using Ceetron 3D Components, you can add premium result presentation to your simulation environment. With the free viewers included in 3DC (Ceetron 3D Viewer and Ceetron 3D Plugin) and with Ceetron Cloud, you can easily share 3D engineering information everywhere with colleagues, partners and customers. 3DC supports Windows (32 and 64 bit), Linux (64 bit), and Mac OSX. 3DC is delivered with platform integration support and examples for: .NET (C#), Qt, wxWidgets, MFC and native Win32. The software can be used with both C++ and .NET languages (e.g., C#). 3DC is built to handle models in an industry that definitely believes More Is Better. Today it easily handles models with tens of millions finite elements and millions of parts. The shader-based graphics provide maximum rendering performance. The result extraction algorithms that provide features such as cutplanes, isosurfaces and isovolumes are optimized to work with the 3DC’s data models. Adding on to a meticulous algorithmic design, result extraction is boosted by parallel computation enabled through multi-core support. Models and results from industry standard CAE applications (e.g., ABAQUS, Ansys), can easily be loaded into the 3DC data model using the Ceetron Import Component. 3DC allows easy export of results to the VTFx file format. Using VTFx to convey results, lets you use our free 3D viewers for Windows, Mac, iOS/Android, and the 3D Plugin for MS Office. Furthermore, the same format gives you instant access to the Ceetron Cloud. Ceetron 3D Components is structured into a set of components that enables a software engineer to develop modular and well structured code. Furthermore, 3D Components is extendable. By design, software engineers can develop custom components which will integrate seamlessly with the system. Finally, 3D Components adapts to all standard GUI development environments. It has no strong links with one given UI toolkit, allowing to develop applications with a wide variety of them: Qt, wxWidgets, and .NET, and is also provided on all major operating systems: Windows, Linux and Mac OS.